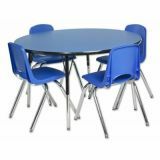 These adjustable-leg activity tables feature 1-1/8" thick tabletops with laminate on both the top and bottom. Color-coordinated, powder-coated upper legs and edgebanding will not fade or discolor. Safe, non-toxic, stain-resistant and easy to clean. 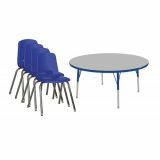 The stackable chairs are perfect for any classroom space and built for comfort and durability. They feature molded seats with vented backs for comfort, reinforced ribbing in back and under the seat for added strength, and steel lower back support. There is no penetration through the seat surface. 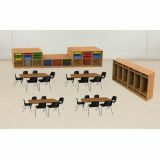 This full classroom package includes (2) Lockers with 3 sections each (6 total), 2 cubby units (2x3), (1) Cubby Storage Unit 1x3, (9) Adjustable Shelves for optimal customization as well as 4 Oak/Black tables (30x60) and 24 Navy Chairs, 18". 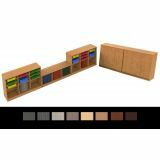 These storage units are perfect modular storage furniture for the classroom of the 21st century. Set includes 6 lockers with coat hooks and doors; 2 storage units (3 wide x 2 high); 1 storage unit (1 high x 3 wide) and 10 adjustable shelves. 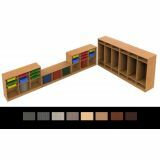 These storage units are perfect modular storage furniture for the classroom of the 21st century. Set includes 6 lockers with coat hooks; 2 storage units (3 wide x 2 high); 1 storage unit (1 high x 3 wide) and 10 adjustable shelves. 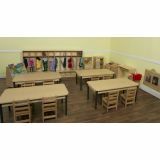 The classroom package includes (2) 5-section lockers, (4) 30x60 HPL adjustable tables, (16) 12" Bentwood chairs, wall display, dress-up center, stationary iron board with iron, book storage and display with markerboard and set of 4 classic appliances. 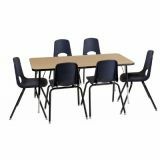 The classroom package includes (2) 5-section lockers, (4) 30x60 HPL adjustable tables, (16) 14" Bentwood chairs, wall display, dress-up center, stationary iron board with iron, book storage and display with markerboard and set of 4 classic appliances. 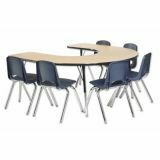 The classroom package includes (2) 5-section lockers, (4) 30x60 HPL adjustable tables, (16) 12" hardwood chairs, wall display, dress-up center, stationary iron board with iron, book storage and display with markerboard and set of 4 classic appliances. The classroom package includes (2) 5-section lockers, (4) 30x60 HPL adjustable tables, (16) 14" hardwood chairs, wall display, dress-up center, stationary iron board with iron, book storage and display with markerboard and set of 4 classic appliances. The classroom package includes (2) 5-section lockers, (4) 30x60 HPL tables-18"H, (16) 12" bentwood chairs, wall display, dress-up center, stationary iron board with iron, book storage and display with markerboard and set of 4 classic appliances.